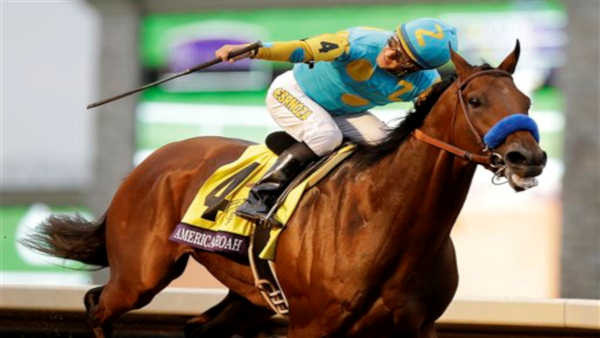 LEXINGTON, Ky. -- Triple Crown champion American Pharoah took charge out of the gate, winning the $5 million Breeders' Cup Classic by 6 1/2 lengths Saturday in his final race before retirement. The 3-year-old colt ran 1 1/4 miles in a track-record 2:00.07 as the sentimental 3-5 favorite among the crowd of 50,155 at Keeneland. Fans stood 20-deep all along the rail, cheering and snapping cellphone photos of the superstar horse. Except American Pharoah didn't hear them. He wears ear plugs to muffle any sounds that might startle him. He paid $3.40, $3 and $2.40. Effinex, a 33-1 shot, returned $14.20 and $6.60. Honor Code was another 4 1/2 lengths back in third and paid $3.40 to show. American Pharoah took on seven rivals after mare Beholder and Smooth Roller dropped out. It probably didn't matter how many faced him on a cloudy, cool day at Keeneland. "We wanted him to go out as a winner," Zayat said. "He is a winner." The colt became the first horse to win the Triple Crown and the Classic in the same year, and the only one to have such a chance since the Breeders' Cup didn't begin until 1984.